They are fine words. I said so at the time. I particularly welcomed her commitment to the most vulnerable, and her emphasis on the need to do more for mental health. Recent governments from the one Mr. Campbell was a part of (the Blair govt.) to the present one have been doing no end of harm to MY mental health with their various disastrous policies. Expecting the current government to do something about mental health seems to me to be about as sensible as seeking charity from a burglar who steals things from your home. Since leaving his post in the terrible Blair administration, Mr. Campbell has been forging a career as a writer, and he has also as he puts it been spending “a fair bit of my time campaigning on mental health”. He has been in the media quite a bit in recent years complaining that he is suffering from depression, and talking about “raising awareness” of mental illness as a wider problem in society. The media have invariably been very sympathetic, and they have devoted an enormous amount of column inches to his complaints about his suffering. I cannot help but also notice that in a great many instances the articles and appearances have coincided with the publication of one of his growing number of books. This story is apparently partly based on his own experiences, because he “suffered from the disease for over 10 years as a young man”. These are just a few examples but there are a great many more that you can easily find with an internet search if you wish. He hasn’t just appeared in newspaper articles to talk about this subject either, he has also been on TV programmes such as Andrew Neil’s “This Week” program as well. I won’t bother my readers with further details of Alastair’s various books because I don’t want to encourage people to read them, I will just mention the fact here that there are quite a lot of them. Call me cynical, but I suspect that to some degree Alastair may be exaggerating the severity of his depression in order to draw attention to his various books. Call me cynical again but I also really do suspect that there is another motivation behind these pathetic appeals for public sympathy for his various “illnesses”, and that motivation could possibly be a desire to deflect criticism for his part in the disastrous Blair government. He was after all a professional spin doctor back in the day, perhaps he still is. Perhaps I am going beyond cynical and into the realm of conspiracy theory when I say that furthermore I suspect that the media may also be collaborating with Mr. Campbell’s “campaigning” efforts out of similar motivations. They have after all been very instrumental in propelling recent governments into office, and covering up the disastrous effects of some of their worst mistakes by simply not mentioning them (a practice I refer to as “lying by omission”). Mr Clegg said the sector needed a breakthrough “comparable to penicillin”. We also have world-class cutting edge research. For example, last year, the Mental Health Biomedical Research Centre in South London identified a way to predict how individuals will respond to certain drugs, by studying images of the brain. This could help us develop better treatment in the future. This is where I start to get really worried, because having identified a problem called mental illness it seems that our politicians are setting the scene for research into pharmaceutical remedies. I suspect they are probably also setting the scene for increasing the availability of such “remedies” through the NHS (I will take a closer look at this possibility another time however as it’s a big subject). 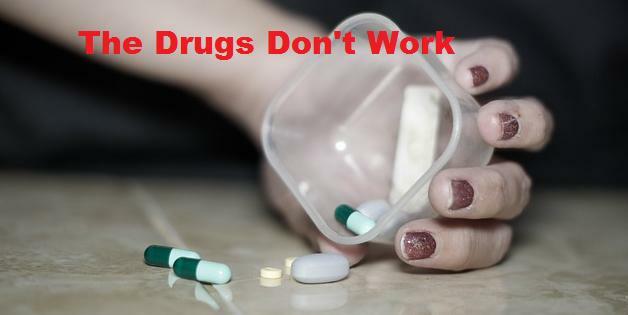 I do not believe that these drugs have ever worked (in fact I rather suspect they often do a lot of harm), or in fact that they ever COULD work, I will now try to explain why. I don’t think depression is an illness, I don’t think people “suffer from depression”, what I think is that people generally become depressed when they are overloaded with anxiety. I think there are other factors as well in some cases (such as the tragic example of degenerative brain disease), but for the most part when people say they are depressed it is in my opinion usually mainly because of an excess of anxiety in their minds. The depression is therefore a symptom of other things, it is not in my opinion an “illness” in its own right at all. In mild cases people can appear to be merely lazy and lethargic, as their overloaded minds are struggling to cope with even simple problems. In extreme cases people can cease to function at all, and their minds can become so confused that it can be almost impossible for other people to make sense of what has gone wrong. It is at this point that we sometimes conclude that someone has “gone mad”. I am not speculating wildly about all this, I am speaking from direct personal experience. I have been depressed at times in my life (I think in truth many if not most people have), and in all these times I can tell you frankly that an excess of anxiety was the underlying cause of my own depression. When we are alone it is harder to rationalize fears and anxieties that we have because we don’t have those soothing voices of reason to either put those fears and anxieties in perspective or reason us out of them altogether when they are unfounded. Sometimes though, the people around us can make our anxieties worse, particularly if they dislike us (often a problem for politicians), but also sometimes by simply failing to understand the causes of our anxieties. I will now try to see if I can be of any assistance with Alastair’s persistent depression by exploring the anxieties that may lie behind it. I do think that if we were to delve inside Alastair’s murky brain we would discover some very real anxieties, and I rather suspect that his depression while perhaps somewhat exaggerated is nonetheless real. If I was Alastair’s psychiatrist I know very well where I would start in trying to uncover and unravel the real anxieties that are causing his depression. I would take him straight back not to his early childhood, but to those days preceding the Iraq war, and I would ask him how he felt about the events leading up to that short war that had such a destructive and long-lasting aftermath. I would ask him if he lay awake at night, tossing and turning, racked with guilt about the “dodgy dossier” and the missing weapons of mass destruction, and the subsequent rise of the Islamic State of Iraq and Syria. Yes, of course Alastair Campbell is depressed, because Alastair Campbell is overloaded with guilt about a disastrous war that he was instrumental in starting. Of course I wouldn’t stop with the Iraq war, I would also ask Alastair about how he felt about the Blair govt.’s program of “rubbing the right’s nose in diversity”, the mass immigration program the disastrous consequences of which our society as a whole is still largely in denial of. I doubt very much if Mr. Campbell has ever been confronted on this topic, living as he does inside the group-think bubble that shields our established elite from criticism. Somewhere buried deep inside that troubled mind though, there must be some guilt about the damage done by this terrible agenda. On the face of it, the mental health awareness campaign would appear to be motivated by deep humanitarian concerns about the well being of ordinary people, but scratch a little bit under the surface and lo and behold it turns out that there are other motivations at play. What better collection of destructive idiots could we possibly look towards to help us with our “mental health” – the irresponsible career politicians and the mainstream media who promote them. Could it even be that these people are also acting as the puppets, the useful idiots, for big global business players – in this case the psychotropic pharmaceutical industry? That oft repeated Latin phrase – “cui bono?” springs to mind. As I said above, I believe that depression and mental illness are usually simply symptoms of an excess of anxiety, and in an awful lot of ways these destructive idiots are actively adding to our anxieties with their destructive agenda. Therefore a sensible practical step towards improving the mental health of the UK’s citizens would simply be to replace the current crop of irresponsible career politicians with responsible far-sighted politicians who genuinely have the public’s interests at heart. I know that such a step would cheer me up no end if we managed to accomplish it.